We created a social campaign called #stillnessinthecity for Seher Wellpower that lives across Instagram, and LinkedIn. We also supplied an effective inbound strategy, a storytelling strategy for Instagram and copy suitable for blog/article and press release. Seher Khan is the founder of Seher Wellpower, an integrated wellness system involving nutrition, movement and mindfulness. She offers one-to-one massage treatments and yoga classes as well as creating personalised wellbeing programmes. With this campaign we increased awareness of the seherwellpower.com corporate offer. We created assets to use across multiple platforms and an accompanying strategy of how best to use assets to reach her audience. MoI presented Seher as a highly credible go-to resource in the corporate wellness field. Portraying an exciting and evocative story which integrates into Seher’s offering. Explain the benefits of Corporate wellness using combination of generated assets, articles, and social posts. We created a social campaign called #stillnessinthecity for Seher Wellpower that lives across Instagram, and LinkedIn. We also supplied an effective inbound strategy, optimizing website for search, a storytelling strategy for Instagram and copy suitable for blog/article and press release. Portray an exciting and evocative story which integrates into Seher’s offering. Explain the benefits of Corporate wellness using combination of generated assets, articles, and social posts. The focus of this campaign was to increase engagement on social channels, particularly Instagram and LinkedIn. 2 day photoshoot across London’s landmarks. We incorporated high quality stills and video. Dynamic Instagram creative that can sit individually as well as in a full set, to engage and capture audience. Comprehensive copy for 21 instagram posts, website landing page as well as article for Linkedin. Succinct hashtag strategy for increased leads. Tailored hashtags for each social post. We often see pictures of #yogis in beautiful postures on the beach or in #meditationpose under a waterfall telling us to just be or something else deep and enlightened! Well it's a little more difficult when we live in an amazing, bustling city like London - don't get more wrong I wouldn't live anywhere else, I love this city. But being #mindful, present and still is not so easy when we're surrounded by traffic, people and noise. 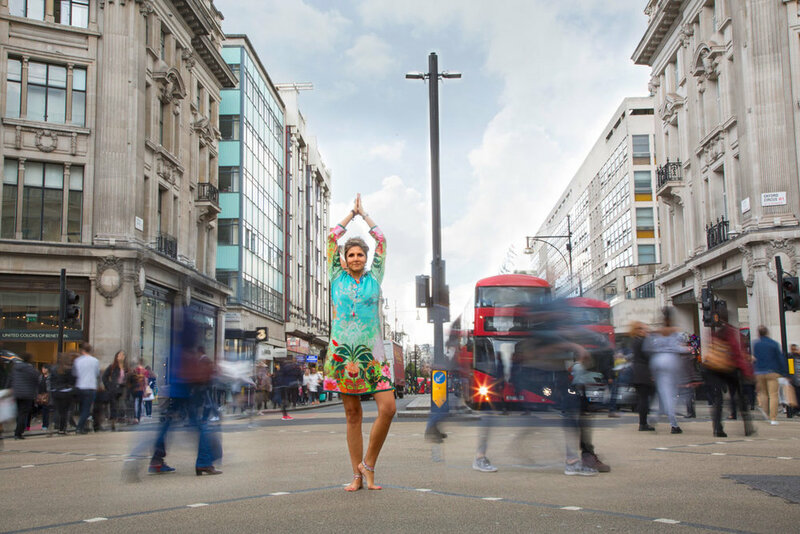 💥 Never mind the noise in our head of juggling time, responsibility, fitness and #metime Doing this #dancingshiva pose taught me that it is possible. The upward bow or #wheelpose has a special place in my heart. For years I did all kinds of variations of the bridge and told myself that I couldn't progress to the wheel. " my arms are too thin, they're not strong enough" " I'm scared of landing on my neck" all sorts of excuses! Until one day my #ashtanga teacher lifted me up into a full upward bow and now I love the upside downess, the heart opening, the amazing #backbend and the opening of the throat #chakra. All that opening followed by #childspose - just poetic. MoI presented Seher as a highly credible go-to resource in the corporate wellness field.